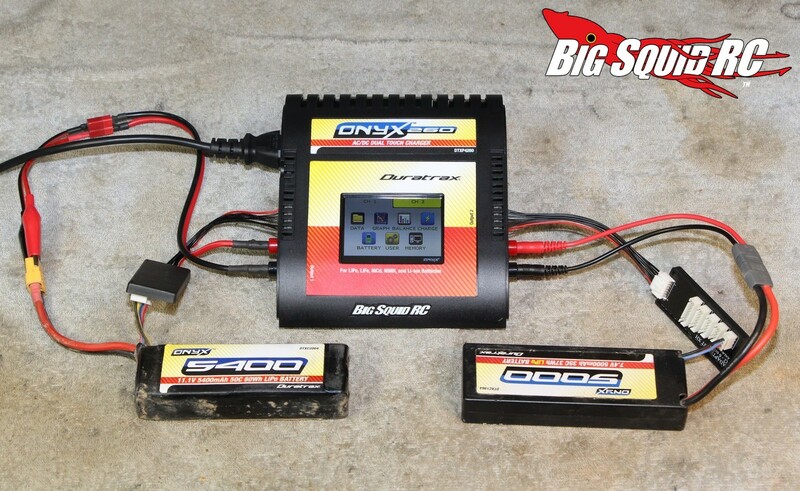 Duratrax Onyx 260 Charger Review « Big Squid RC – RC Car and Truck News, Reviews, Videos, and More! 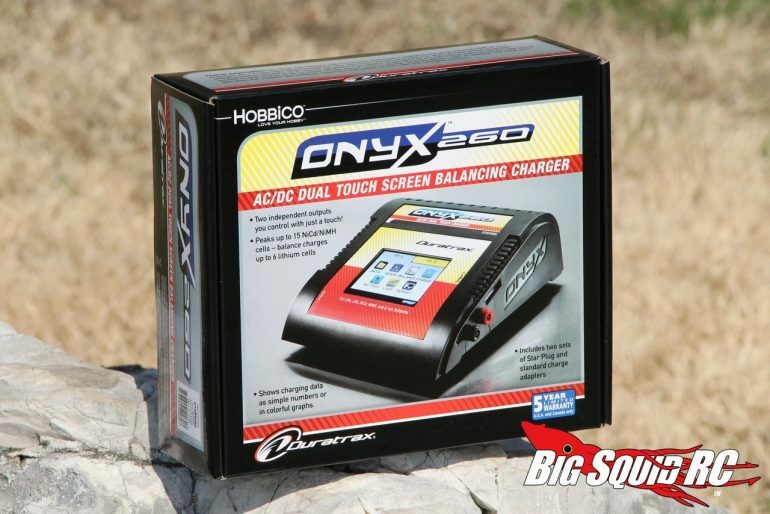 With dual port chargers all the rage, the folks at Duratrax have released the Onyx 260. Not only does the Onyx have two charge ports, but it also comes with a nifty touch screen display. We’ve been using (read- abusing) an Onyx 260 for several weeks to determine if it is up to the basher lifestyle. Keep on reading to find out if it can take the daily beatings that a basher puts a charger through, to find out how well it charges a battery pack, and to see if we think it is worth your cold, hard cash. What’s In The Box: Inside the box you’ll find the charger, instructions, DC input cable, AC cable, a pair of Tamiya battery connectors with charge leads, and a pair of Star (t-style) connectors with charge leads. Build Quality: We could find no fault with the build quality of the charger or with its wiring. Testers: Robbie G, Hawaiian Chris, T-Mohr, and yours truly. Set-up Notes: We used the Onyx off of both AC and DC power. For batteries we charged a large array that included small 4 cell receiver packs all the way up to large 6S LiPo batteries. Ease of Use: Yes indeed, we really liked the touch screen, and its menu system, on the Onyx 260. Setting the charger up was extremely simple, as was programming the model memories. The touch screen on the Duratrax responded well to touch and definitely made the charger easier to use. Yes, even if you are a first day noobie, you should be able to get a pack charging without have to resort to looking at the manual. We also gave the manual a good read, if you should have to use it, we found it well written and easy to understand. Power: At 60 watts per channel, the Duratrax has good power, but not as much as some other chargers on the market. With a total of 120 watts at your disposal, you can charge a pair of 2S packs at 6 amps, which is a pretty popular charge rate for most bashers. Nope, it isn’t the most powerful charger on the market, but has enough power to satisfy most typical bashers. On the Track: Perhaps the most important part of testing a charging is doing real world testing. 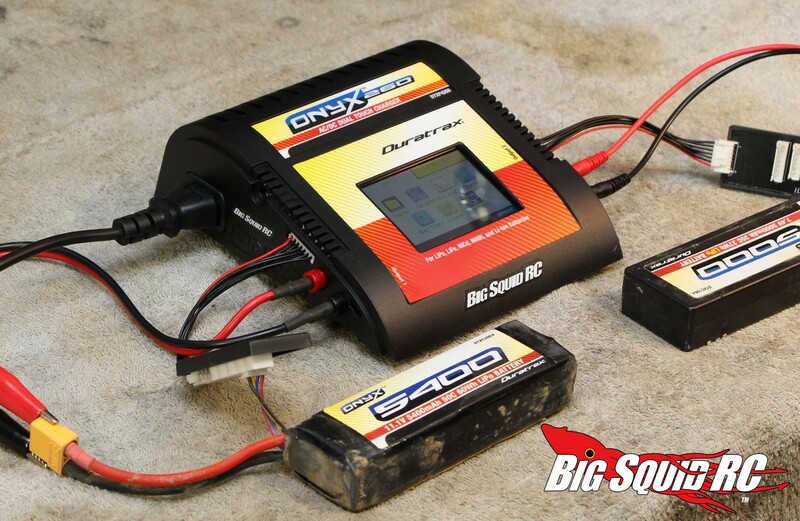 We used Duratrax 2S 5000 and Duratrax 3S 5400 LiPo packs for our on-track testing to find out if the Duratrax put out a solid charge. 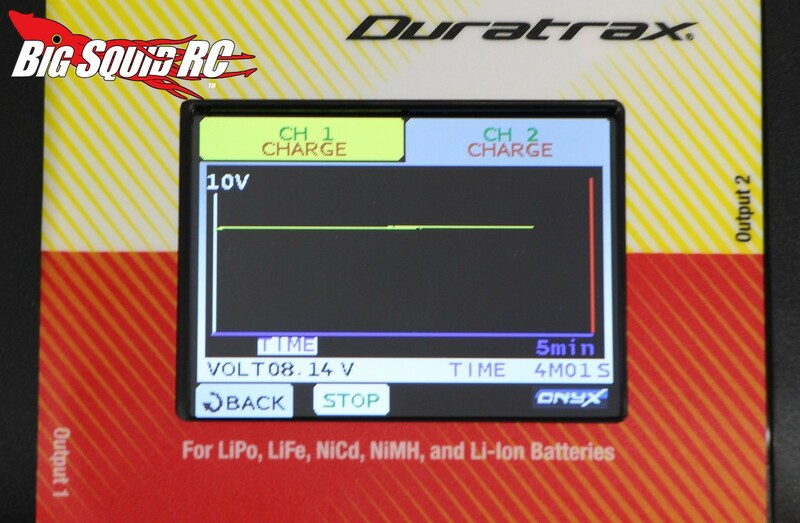 We had our drivers drive a pair of vehicles (a Pro-Line PRO-MT and an ARRMA Fury) not knowing if the battery they were using was charged on the Duratrax or on our reference iCharger 308. At the end of the day, none of our testers could reliably tell a difference when driving on the track. 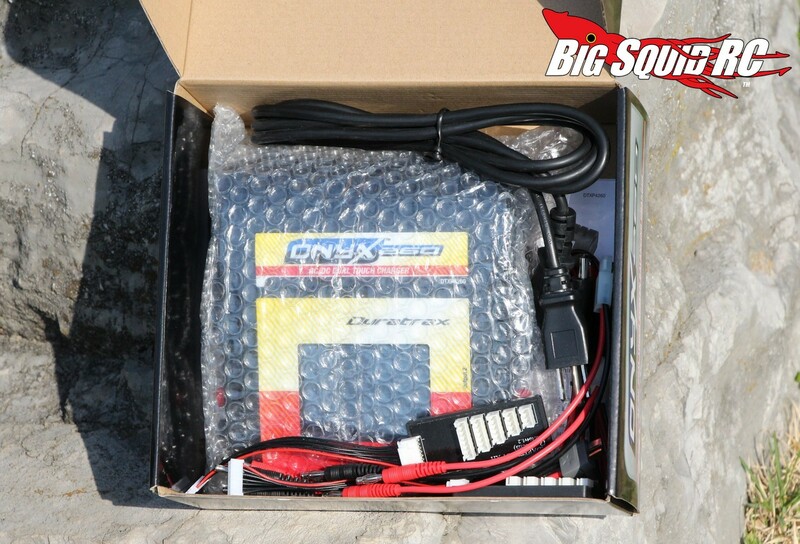 What this means to you is that we feel the Duratrax did an admirable job of charging LiPo packs, at least good enough that we couldn’t tell a difference when driving. All the cabling that came with the Onyx 260 was of the proper length. In fact, it came with one of the longest AC cords that we have seen, and that is a very good thing. The fan on the Duratrax was fairly loud. You won’t notice it so much if you are in a noisy environment or if you are outdoors, but if you charge indoors in a quiet spot you will definitely hear it. The angle on the front of the charger worked well. We found it made the screen easy to read, both on a pit table or when used in a DC application under the hood of a car. Yes, we beat the Duratrax around for weeks, and besides a few scratches here and there, it still works fine. 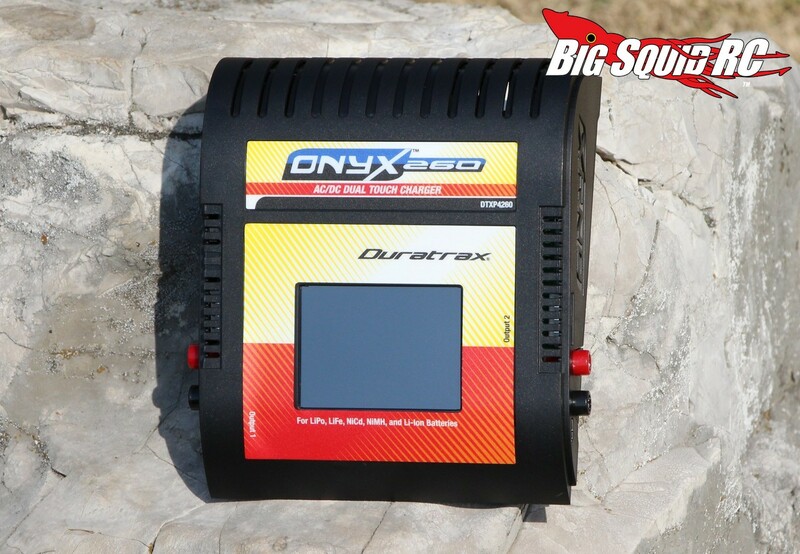 Final Verdict: The crew at Duratrax call the Onyx 260 “the most advanced Onyx charger ever” and we would have to agree with that. It uses a high quality screen that responds properly to touch inputs and has decent power. That wonderful touch screen also makes it arguably the easiest to use Onyx charger we’ve ever used. We found it did a solid job of charging various battery packs and took a good beating without breaking.